For the best maps of the trails in the Flagstaff Area, check out the info below. Note: None of the maps are complete and some old trails that are now closed currently show up on some maps. Additionally there are several 'hidden' trails that are not on any of the maps. Don't get lost... stay on marked trails. For the most complete maps, check out: http://www.openstreetmap.org This site has almost every trail listed and is constantly being updated. Be sure to have the cycle layer turned on. Most of the Singletrack trails west of and including Schultz Creek trail have been put in by Dirt Bikers and those trails are also largely maintained by Dirt Bikers, so PLEASE don't complain against our motorized friends - Mountain bikers, hikers and horse riders all get to use these trails because of Dirt Bikers! Pinkbike is now promoting "Trail Forks" - an online bicycle map that is user generated. It's pretty good, with pretty accurate trail ratings. A word of Caution: Do NOT rely on mapping apps. Search and Rescue teams have encountered numerous situations where someone was lost due to using a smartphone app. The batteries in smartphones die. The GPS in smartphones can be inaccurate. Apps can crash. We have found Google Maps and Apple Maps to be off location by over a mile in Arizona, particularly when not on paved roads. Don't be a statistic! Buy a paper map and learn how to use it. Paper maps do not need batteries, just brains! John Finch is one of the very best trail builders in Arizona and we have him to thank for numerous trails and trail improvements. However John has twice been accosted and fined by the Forest Service for doing "unauthorized" trail maintenance. Trail maintenance that the Forest Service has failed to perform and instead has spent their budget by opposing public use of public lands. As of December 2014 the Democrat controlled Forest Service has again banned John from entering the woods. When riding in Sedona, stay on trail and/or slick-rock. Riding off trail, though legal mostly, is bound to get you some thorns in your tires. I literally had about 50 thorns in one tire from just a short ride off trail. A common mistake hikers and bikers make is piling rocks along the edge of a trail as a border. PLEASE DO NOT do this. 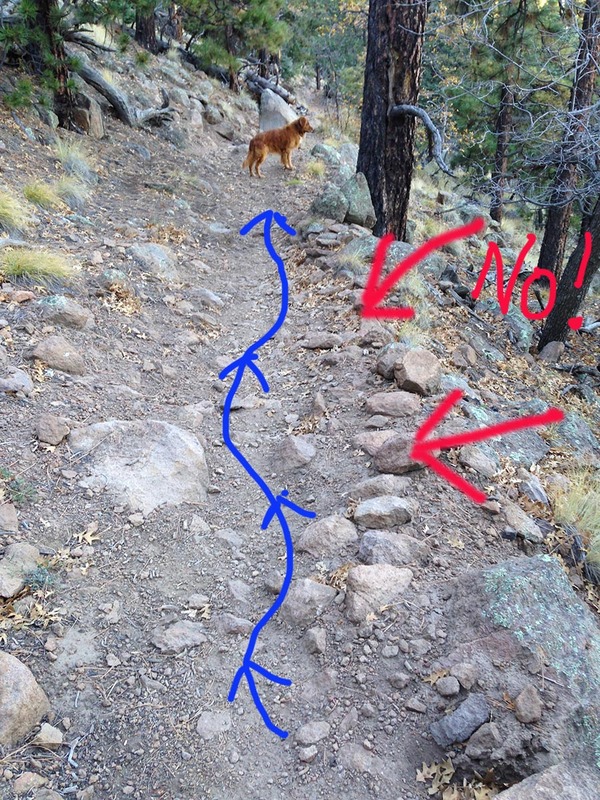 It causes water to run down the trail, rutting it out (blue line below). It is much better just to let the water flow off the side of the trail. Pictured here is the Lower Brookbank trail in Flagstaff. If you see rocks stacked like this on the downhill side of a trail, DO NOT add to them. In fact, in most cases, you can help save a trail by removing those rocks. Sustainable trail design includes "Full Bench" trails. A "Full Bench" trail is out-sloped 5% to allow water to flow directly across the trail instead of down the trail.